The Biceps Bible - Part 3: The Best Exercises For Building The Biceps Of A Titan! The Biceps Bible is the first volume in the Fitness Bible series. You wanted a guide to hypertrophy and building monster mass that's 100% guaranteed. And now you can stop looking! Check out the Biceps Bible part 3 below! The Biceps Bible is the first volume in the Fitness Bible series. The Fitness Bible is a compilation of texts that breaks down specific muscle groups in terms of the training methods necessary to achieve maximum hypertrophy, the increase in the size of the muscle cells, of the particular muscle group. As already discussed, training for muscle hypertrophy requires isolation. To properly isolate a muscle it is extremely important that other muscles that can potentially assist with the movement do not become involved. When muscles other than the target muscle(s) become involved in the movement, the effectiveness of the exercise is considerably diminished. This is known as compensation, and the likelihood of it occurring increases as the isolated muscle(s) fatigues towards the latter part of the set. Common types of compensation during most biceps exercises are the backward swinging of the lower back and the forward jerking of the shoulders and elbows. The powerful type IIb fibers of the biceps muscle are prone to tearing if stressed too much. While compensation should always be avoided, it is also not a good idea to attempt further repetitions after muscle failure has been reached. Muscle failure occurs when an additional repetition cannot be successfully performed without some form of compensation from other muscles. At this point the exercise should be stopped, unless an experienced spotter can assist with several additional repetitions. Two effective approaches can be used if the muscle begins to fail before the target number of repetitions is reached. The first approach entails reducing the weight by about 20-30% as soon as the muscle starts to fail and completing the remaining number of repetitions with the decreased weight. An alternative tactic you can use is to only complete as much of the motion as possible without compensation once muscle failure sets in and the full motion can no longer be completed with proper form. With some of the exercises in this book, you have the option to either move both arms simultaneously (bilateral movement), or you can move each arm individually (unilateral movement). As each method has its advantages, it is a good idea to incorporate both bilateral and unilateral movements into the training program. Specifically, if you notice that one arm consistently produces more force than the other during the bilateral movements, you should switch to the unilateral movements until both arms are capable of producing an equal amount of force. The Exercise: the grip of the barbell should be shoulder width. The stance should also be shoulder width, with a slight bend in the knees to allow for maximum stability of the trunk and upper body as the exercise is performed. During the first part of the movement, from when the arms are straight to approximately 60 degrees elbow flexion, the brachioradialis muscle is actually more involved in the flexion of the elbow than the biceps muscle. The biceps muscle is most active between approximately 70-110 degrees elbow flexion. Thus, you can emphasize either the brachioradialis or the biceps muscle by varying the range of motion accordingly. This is also true for the other exercises in this book. Variations: for this exercise, the alignment of the shoulders determines which of the two heads of the biceps is more active in the motion. The long head of the biceps is more involved when the shoulders are extended. Thus, performing the exercise standing straight up with the shoulder blades pulled back will stress the long head of the biceps more than the short head. Conversely, performing the exercise with the shoulders moved forward past the midline of the body (shoulder flexion) will engage the short head of the biceps more than the long head. When performing the exercise with the shoulders in a flexed position, it is a good idea to also bend the torso approximately 15 degree forward to help with stabilization. Start with a smaller EZ or curl bar before using a standard 45 pound Olympic bar, as it will be much easier to control the smaller bar. Never swing the lower back to facilitate with the lift. Concentrate to make sure that the bar moves as straight as possible to avoid stressing one arm more than the other. The Exercise: the motion for this exercise is similar to that of the barbell curl described above. The exercise can be effectively performed standing up, or sitting down on a flat bench with firm back support. The seated variety helps in preventing compensation by stabilizing the upper body and trunk. It is important to note that using dumbbells requires a greater degree of stabilization than the barbell. Thus, it is highly unlikely that you will be able to lift the same amount of weight with proper form using the dumbbells as you will by using the barbell. Variations: the advantage of using dumbbells is that virtually every part of the biceps can be isolated by slightly modifying the movement. As with the barbell curl, the positioning of the shoulders will determine which of the two heads of the biceps muscle is more active during the movement. A very effective modification of this exercise is to rotate the forearms 90 degrees and back at the top of the movement, when the dumbbells are near the shoulders. This action will additionally challenge the biceps muscle, as well as engage the brachioradialis. The biceps muscle can be further challenged by making sure that the wrists remain in neutral position throughout the lift. By not flexing the wrists, the stress on the biceps muscle increases because there is no assistance from the wrist flexor muscles. Really concentrate to avoid swinging the back, shoulders, and elbows, as there is a high tendency to do so when using dumbbells. It is a good idea to perform both bilateral and unilateral movements for this exercise. The Exercise: this exercise is performed much like the regular dumbbell curl described above. What makes the hammer curl different, however, is the grip of the dumbbells throughout the movement. For this exercise, the dumbbells are essentially held just like the handle of a hammer, with the palms facing each other all through the motion. Using this grip increase the involvement of both the brachioradialis muscle. The hammer curl can also be effectively performed standing up or sitting down on a flat bench with firm back support. One important note for this exercise is that the arms should not be locked out when the dumbbells are coming back down because this will place unnecessary stress on the connective tissue of the elbows. Variations: one variation of the hammer curl is to rotate the forearms 90 degrees (clockwise with the right arm and counterclockwise with the left arm) and back at the top of the movement, when the dumbbells are near the shoulders. This action will additionally challenge the biceps muscle, as well as considerably engage the brachioradialis. Another variation of this exercise is to curl the dumbbells only to the point of 90 degrees elbow flexion, and then complete the forearm rotations described above. This latter variation really challenges the biceps muscle because the biceps is particularly active in rotating the forearm when the elbow is in 90 degrees flexion. Really concentrate to avoid swinging of the back, shoulders, and elbows. If you start noticing that you are losing control of the grip during the exercise, try shifting the grip to just under the front head of the dumbbell. The Exercise: this exercise is done with the use of a regular preacher bench. However, do not sit down on the preacher bench, as curling in this position will increase the likelihood of compensation, as well as put a lot of stress on the tendons and ligaments surrounding the elbow and wrist. Instead, this exercise is performed in a standing position, with the legs sprawled and the upper body firmly pressed against the preacher pad. The preacher pad should be placed directly under the armpits for maximum stabilization of the elbows and shoulders. The bar should be gripped narrowly, no further than shoulder width apart. Since this exercise is performed with the shoulder in a flexed position, the short head of the biceps muscle will be more active than the long head. Variations: this is an excellent exercise for targeting the brachialis muscle. The preacher pad makes it easier to limit the range of motion from approximately 100-120 degrees elbow flexion when the brachialis muscle is strongest. The bar used for this exercise should either be either an EZ bar or a standard curl bar. Concentrate to keep the armpits secure over the preacher pad; this will help in avoiding compensation from the shoulders and back. If the preacher pad has an adjustable seat, lower the seat all the way down so it is not in the way when standing over the pad. Be careful not to overextend the elbows when lowering the weight (especially if using heavier weights). The Exercise: the motion for the reverse curl is very similar to that of the regular standing barbell curl, except that the bar is gripped with the palms facing down (forearm pronated). When the forearm is in this position, the brachioradialis muscle becomes significantly more active, while the biceps muscle's ability to produce force is considerably diminished. As a result, you will not be able to lift near as much weight during this exercise as you will during the conventional standing barbell curl. Also, stabilizing the bar is more difficult with this grip, thus, if possible, it may be a good idea to use a smaller straight bar instead of the standard 45 pound Olympic bar. Make sure that the wrists remain neutral throughout the exercise, as there is a tendency to compensate with the lift by curling the wrists upward. Avoid any jerking of the elbows, shoulders, or back. Keep the elbows pressed to the sides of the body to prevent them from swinging outward as the muscles fatigue. The Exercise: the starting position for the standing cable curl should be identical to that of the standing barbell curl. The proper cable attachment for this exercise should be either the 20 inch straight bar or the 28 inch curl bar, whichever one you can control better throughout the movement. If the cable machine is adjustable, the bar should be positioned at the lowest possible height level. Variations: one advantage of using the cable machine is that it is very easy to modify the shoulder position to target the short or long head of the biceps muscle. When moving the shoulder forward to emphasize the short head of the biceps, you can try positioning your body in a staggered stance for improved trunk and upper body stability (the staggered stance is where one leg is positioned directly in front of the other, as if getting ready to perform a lunge). This exercise can also be performed effectively with one arm. The proper cable attachment to use for the single-arm curl is either the nylon or steel handle. When performing the one-arm cable curl, the opposite arm should rest comfortably at the waist. There is a very high tendency to compensate with the elbows and shoulders during this exercise, so it is important to concentrate hard to prevent this from happening. Never let the weight stack crash against the unused plates when bringing the weight down. Make sure that one arm isn't being stressed more than the other when performing the two-arm curl. There should be about a foot of space between you and the weight stack when performing the exercise with the shoulders pulled back, and roughly a foot and a half of space when the shoulders are flexed. The Exercise: an advantage of the cable hammer curl over the dumbbell hammer curl is that it much easier to maintain the grip of the triceps rope than the dumbbells as the forearm muscles fatigue. To perform the hammer curl using the cable machine, you will need to attach the triceps rope to the lowest level of the pulley. The rope should be gripped with the palms facing each other. There needs to be about a foot of space between yourself and the weight stack. Press the elbows against your sides to help prevent compensation from swinging the elbows and shoulders. Remember that the hammer grip will place more emphasis on the brachioradialis muscle. The rope should be spread so that the forearms are shoulder width apart throughout the entire motion. The Exercise: start by standing directly in the middle of two cable pulleys. If possible, adjust the height level of the pulleys so that they are about 8 inches above the top of the shoulders. You will need to attach either the nylon or steel handles on each side of the pulley (make sure that the two handles are identical). The handles should be held in an underhand grip, so that the palms are facing the ceiling. The exercise is performed by curling the forearms towards the top of the shoulders, making sure that the shoulders remain flexed 90 degrees sideways (lateral flexion) throughout the movement. The stance should be shoulder width apart, with a slight bend in the knees. 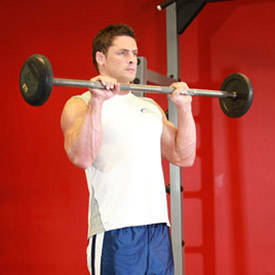 The shoulder alignment for this exercise means that the short head of the biceps is emphasized more than the long head. This is the exact same implication as if the shoulder was flexed forward, which was the case in many of the previous exercises. Variations: Like the preacher curl, this exercise is excellent for targeting the brachialis muscle because it allows you to easily limit the range of motion from approximately 100-120 degrees elbow flexion. If possible, face the mirror to help in monitoring form. Make sure that the elbows and shoulders remain completely immobile throughout the movement. Take your time to make sure that you are standing as close to the middle of the two cable pulleys as possible. Keep the shoulder blades pulled back throughout the movement. Like I said in part 1 of the Biceps Bible, as you go through the training program in this book, you may begin to wonder why you are seeing a minimal increase in muscle strength compared to a considerable increase in muscle growth. The reason for this is that all components of the training program in the Biceps Bible are specifically developed to maximize muscle growth and not muscle strength. If you've been looking for a 100% guaranteed-to-work guide to building your biceps, the Biceps Bible is it. So get off the computer and hit the iron! Good luck!